Dang, going back through my screenshots and such, it's quite surprising what I got accomplished this weekend. It started Friday with the Gold Team going to 25 man Naxx. We quickly cleared it, but had some fun when we got to Sapphiron and Kel'Thuzad. On Sapph, we turned off mage armor, frost resist auras, and anything else that would put our frost resist above 100. After one wipe due to the tank somehow dying, we came back in and quickly took care of him, earning Heroic: The Hundred Club. We then quickly moved to Kel'Thuzad and thought we would keep our achievements going and proceeded to have the most hectic KT fight I've ever seen. We decided to go for Heroic: Just Can't Get Enough and though we lost one person during that, he was rezzed and we continued on. I unfotunately died somehow from a mana blast that hit me for 20,000 damage. I got rezzed (and it was a good thing they picked me up), since at about 20%, he Ice Blocked our paladin who was tanking two of the adds. So those adds got free and we lost a healer before the main tank, Aravic, was able to pick them up. So we had Aravic tanking KT and two adds for a while until the other add tank could peel one off of him. And we continued the fight like that. Then all hell broke loose. With KT and an add on him, Aravic went down. I immediately went invisible to drop all aggro. Let the healers die I say! I quickly returned from invisibility and DPS'ed with all I had. And we did it. Somehow, a few of us DPS remained and were able to take out KT without a tank. We had just enough to power through him as he moved from target to target one-shotting them. We would have gone to Emalon next, but the Horde held Wintergrasp so we called it an early evening. Saturday took me back out to Icecrown where I became an Exalted Champion of Ironforge. The day also saw me get my 40th Champion's Seal which I used to quickly purchase pet #91, my Mechanopeep. I had hoped to get a 10 seal bonus like I did when I became a Champion of Gnomeregan, but no luck. Apparently you only get the 10 seal bonus on your first Championing, so it will be 8 days from Saturday (next Sunday) until I can get my next pet - I think it'll be the Elwynn Lamb - a nice change from your normal pet. With becoming an Exalted Champion of Ironforge, I also hit 6,000 achievement points. Later in the day I was invited to the Black Temple, and after some struggles on the later bosses, we made it to Illidan. Unfortunately, coordination was poor and even though we got him to stage 4, we never got him down and after spending 5.5+ hours in there, I had to leave. It was just too frustrating, and in the end, they never got him down. Sunday of course brought with it Noblegarden so out to collect eggs I went. I found a nice spot in Dolanaar that I was able to camp with 5 eggs within reach without moving. I quickly picked up over 250 and found everything I needed. I got my Tome of Polymorph: Rabbit for 100 chocolates, but found the Spring Rabbit's Foot in an egg and all the clothing except the dress in eggs. I then went out, did the other quests and quickly earned my title of Tiddlywinks the Noble. 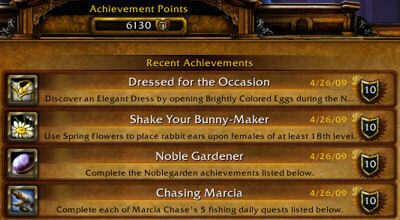 After doing my daily quests and taking some time off, I awoke late in the night and went to Azure Watch where I found very little egg competition, and on my 2nd egg, I found the dress and completed every Noblegarden achievement. Yay! As I said, "nerf cats!" grats on all of your achievements! I'm pretty sure that if we can get 3:00 min achievement on Patch, we'll be setting all sorts of personal records. Last Friday, Eilonwie stayed in viper the whole time by accident (I'd make a joke, but I've done the very same thing), and we were missing one dps.